"Makalea" is at Lanikuhonua Cultural Institute on the west side of Oahu, where it is used in cultural education program with emphasis on environment and its its resources. Our family run business, started more than 20 years ago and is located in a rural area of the Waianae Mountains on the island of Oahu. Our home and shop are located on the property along with a lumber kiln and storage areas. The majority of our lumber inventory is harvested directly from green waste and cut in our saw mills and dried in our solar kiln, thus we control the drying and seasoning process of the lumber. 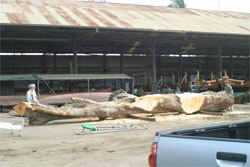 McD prepares a log for the Friends of Hokulea. Not only born and raised in the islands, but part Hawaiian as well, McD has been a professional wood worker for more than 25 years. Growing up as the son of a prominent interior designer whose specialty is the Hawaiian/Kama'aina look, his love for these traditional elements is only natural and is what brought him to specialize in woodturning and veneer work. 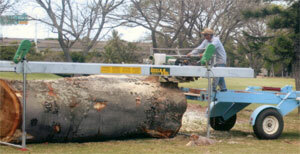 Using a mobile saw mill, McD salvages a fallen tree from a golf course. As a custom furniture maker he has worked through this process with many satisfied designers and clients. This design process has also allowed him to continually challenge himself and his abilities. 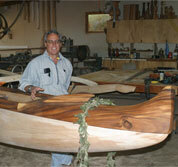 He believes this is the most important aspect in the evolution of his wood working skills. If you are looking to order or commission a piece of furniture and would like a tour of our operation and lumber selection, please contact us. You are welcome.